(Beyond Pesticides August 29, 2016) Last week, the state-owned China National Chemical Corporation cleared a major hurdle in its quest to acquire Swiss seed and chemical company Syngenta, getting the nod of approval from a United States regulatory agency to move forward with the deal. The decision came from the Committee on Foreign Investment in the U.S. (CFIUS), a government body with the power to block deals it deems a threat to the nation’s security. Environmental groups opposed to the merger were waiting on this decision with baited breath, urging CFIUS to oppose the deal, given it has previously proven to be an obstacle for cross-border agreements involving Chinese companies. 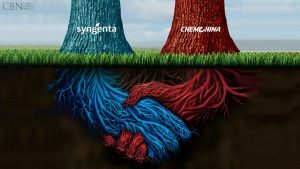 The agency’s authority to weigh in on the merger stems from the fact that about a quarter of Syngenta’s sales come from North America. CFIUS’s decision to let the merger move forward is a major cause of concern to those who would like to see a transition away from chemical-intensive, or conventional, agriculture, as China has been open about its plans to use this deal to increase the availability of genetically engineered seeds and their correlating herbicides and insecticides available for use within their country. Such a drastic increase in available pesticides would expose the massive Chinese population to toxic chemicals at unprecedented rates, as well as create the conditions for wide-spread crop resistance to develop. There has been a flurry of activity and mergers in the big agricultural and chemical industries lately. In December 2015, chemical giants DuPont and Dow Chemical Companies announced that their boards of directors unanimously approved a merger of their companies through an all-stock deal, valuing the combined market capitalization at $130 billion. Then, in May of 2016, Bayer AG made a takeover bid for Monsanto, worth $42 billion, in an attempt to swallow the global seed and chemical producer and become the world’s biggest farm chemical supplier. Though the first bid was rejected, the companies are reportedly close to reaching a final deal to move this merger forward. Specific details of the terms remain unknown. The ChemChina takeover of Syngenta would be the largest merger yet, valued at $43 billion. Many of these big agricultural and chemical companies have been struggling to cope with falling demand for farm chemicals due to falling crop prices and a strong dollar, and may believe that a merger will provide longer-term security. However, for the billion-dollar agrichemical industry, a merger is likely to only provide short-term stability, increase the wealth of top executives, and raise the cost of food, as the new corporation will create a near monopoly that will allow it to increase prices. In the long-term, the market will reveal that relying on the promotion of chemical-intensive agricultural practices is not a sustainable business practice. Chemical-intensive agriculture depends on chemical fertilizers and toxic pesticides that have been shown to reduce soil organic matter and decrease the diversity of soil biota. These chemical inputs contaminate waterways leading to eutrophication and “dead zones,” where nothing is able to live or grow. Eventually, as chemical intensive agriculture depletes organic matter in the soil and there is nothing left with which to grow food or sustain life, toxic chemical inputs will become obsolete. Sustainability advocates say that the only way that the agricultural industry can create a sustainable business model is to produce products that are compatible with organic agriculture. While some argue that organic is too expensive, the simple fact is that chemical companies are able to externalize the social cost of their products in the form of eutrophication, soil erosion, harm to wildlife, illness (lost productivity) and health care costs to consumers, pollination, and numerous other adverse effects. Some researchers calculate the adverse impacts to health and the environment to be as much as $16.9 billion a year (Tegtmeier and Duffy 2004). If consumers paid the true cost of conventional food production, prices for conventionally grown goods would certainly be more expensive than organic products, which are certified through a process that protects human health and the environment. Now that the U.S. has effectively given the go-ahead to the merger, the last chance for opposition moves to Europe, where the European Commission is currently pursuing a full-blown investigation into the proposed merger of Dow Chemical and DuPont Co., looking specifically at antitrust concerns and whether the deal would reduce competition in the chemical industry. European regulators are expected to scrutinize the ChemChina and Syngenta deal with just as much detail, given the fact that ChemChina owns a majority stake in Adama, a large insecticide and weed killer supplier in the region alongside Syngenta and Dow Chemical Co. Even if antitrust violations are found, the companies would likely be able to resolve any concerns by selling off assets, eliminating avenues to stop the merger from moving forward. Good organic practices work to build the soil and maintain an ecological balance that makes chemical fertilizers and toxic synthetic pesticides obsolete. Claims that organic agriculture cannot feed the world because of lower yields are contested by scientific studies showing that organic yields are comparable to conventional yields and require significantly lower inputs. This evidence directly contradicts the Chinese government’s claims that acquiring Syngenta will help them feed their growing middle class through the implementation of western industrial farming practices. Organic agriculture advocates say that it is not only necessary in order to eliminate the use of toxic chemicals, but to ensure the long-term sustainability of food production. This entry was posted on Monday, August 29th, 2016 at 12:00 am	and is filed under Agriculture, Alternatives/Organics, Announcements, Syngenta. You can follow any responses to this entry through the RSS 2.0 feed. You can skip to the end and leave a response. Pinging is currently not allowed.